The Wild Bill Hickok Rodeo, named one of the top 5 professional outdoor rodeos in America for 1995, 2001, 2002, 2010, 2011 and 2016; and the Top Large Outdoor Rodeo in the Prairie Circuit for 2003, brings you America’s original extreme sport. 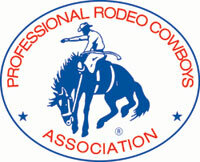 The 2012 rodeo had a total number of 427 entries with a payout of $72,529.00. Total added money has increased from $37,500 to $50,000 for 2018. Nearly 500 cowboys and cowgirls, world champions and the “young gun” contenders alike, make their way to Abilene each year to compete for prize money and the hopes of adding points to qualify for the National Finals Rodeo. The Abilene, Kansas fairgrounds are home to the Wild Bill Hickok Rodeo, Central Kansas Free Fair, Demolition Derby, Western Heritage Festival, and many other events. Riding is done with a one hand rigging. The rider must have the spurs over the point of the horse’s shoulders when the horse’s inside shoulder breaks the plane of the chute and rides for eight seconds without touching the free hand or being bucked off to have a qualified ride. Rodeo’s “classic” event, saddle bronc riding, has roots that run deep in history of the Old West. A hack-rein and a modified saddle are used in this event. The rider must have the spurs over the point of the horse’s shoulders when the horse’s inside shoulder breaks the plane of the chute and ride for eight seconds without touching horse or saddle with the free hand, losing a stirrup, or being bucked off to qualify. Riding is done with one hand and loose rope, with or without hand hold. Rope must have a bell. Riders will be disqualified for being bucked off or touching animal with free hand or not competing the 8 second ride. The winner of the event will be the rider with the highest marking on the bull ridden. In barrel racing, the contestant enters the arena at full speed on a sprinting American Quarter Horse. As they start the pattern, the horse and rider trigger an electronic eye that starts the clock. Then the racer rides a cloverleaf pattern around three barrels positioned in the arena, and sprints back out of the arena, tripping the eye and stopping the clock as she leaves. The contestant can touch or even move the barrels, but receives a five-second penalty for each barrel that is overturned. The All-Around Cowboy is considered by many to be the most talented and versatile cowboy. The PRCA cowboy, who wins the most prize money while competing in at least two events, wins the all-around crown. The only true team event in the sport of rodeo. Comprised of a Header and a Heeler. The steer is given a head start that is determined by the size of the arena. If the header leaves the box before then the team is assessed a 10 second penalty. The Header’s job is to rope the animal around the head and change the animal’s direction so that the heeler can attempt to rope both hind feet. If the Heeler ropes only one hind foot a five second penalty will be assessed. This event takes precise timing and great team work. The team roping best typifies how sick or injured animals are treated on the range today. It is a very safe and effective method for keeping herds of cattle healthy. The Bulldogger starts on horseback in a box. Wrestlers must remain behind the rope barrier until the steer crosses the advantage point line or a 10 second penalty will be added. The wrestler, assisted by a hazer to keep the steer close, pursues the steer. The wrestler slips out of the saddle, down onto the steer’s back, sliding forward to grab the steer’s horns, extending his legs to slow the steer and wrestle it to the ground. All four legs of the steer must be extended on the same side to be legal. The Cowboy starts on horseback in a box. Ropers must remain behind the rope barrier until the calf crosses the advantage point line or a 10 second penalty will be added. The roper ropes the calf, dismounts and throws the calf, and ties three of the four legs. The roper must get the calf up if it is down when he gets to it and then throw it. There is a maximum of 25 seconds allowed to complete the catch and tie.